Bothy bags are often seen as the preserve of outdoor pursuits instructors and alpinists for use in “emergency” situations. Thus leaving recreational hill walkers, mountaineers and climbers to miss out on a fantastic product. The Terra Nova Superlite Bothy 2 perhaps perpetuates this yet further with a large price tag (£100). However, rather than looking at this as an expensive product that you’ll never use. Instead you might look back and wonder how you ever survived without one. At 253g the Terra Nova Superlite Bothy 2 is lightweight enough to be put in the rucksack without too much consideration for most users. At approximately 68% the weight of the standard Bothy 2 (370g), the Superlite is a significant weight saving (Whilst 117g is relatively minimal weight difference, to save over 30% on the weight of any piece of equipment is worth considering). The omission of windows may not be to the liking of some as it makes it harder to accurately “see” what the weather is doing. Although you will definitely feel and hear what the weather is doing as you can generally feel precipitation and you will still get buffeted in high winds. Likewise the omission of pole sockets from the Terra Nova Superlite Bothy 2 may not please everyone, however on such a small bothy bag where the two people effectively form the structural integrity of the shelter it could be argued that pole sockets are of a lesser importance (in contrast to larger bothy bags). Note: the one on test here does have a singular pole socket and the stuff sack section could also be utilised. Using an extremely lightweight fabric the Superlite will not withstand much abrasion, however it retains the concept of more durable fabric for the seats from the Bothy 2. Ultimately a bothy bag should not receive significant abrasion (in contrast to something like a rucksack) but is more likely to be ripped from a sharp rock or misplaced crampon or ice axe. Due to the relatively diminutive size of Superlite Bothy 2 an organised approach will make for a more comfortable time. Lightweight (253g) – older bothy bags were often cumbersome and heavy making the decision not to take one more likely. Small pack size and compressibility mean it can be stuffed with ease in to the corner of a rucksack or lid pocket. Lack of windows means you can’t actually physically see what the weather is doing. Lightweight fabric is more susceptible to damage, although a more cautious approach and good organisation can alleviate this. Price; at £100 it is over double that of many other 2 man bothy bags. 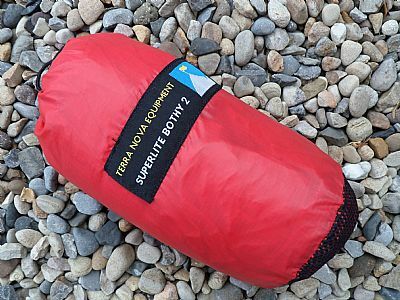 The Terra Nova Equipment Superlite Bothy 2 is a genuine stand out product; for those familiar with bothy bags it is step forward in terms of weight saving and compressibility and for those who’ve never used bothy bags before it will be an amazing revelation on cold wet windy days.